For courses in Principles of Microeconomics. 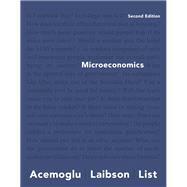 Throughout Microeconomics, 2nd Edition, authors Daron Acemoglu, David Laibson, and John List use real economic questions and data to help readers learn about the world around them. Taking a fresh approach, they use the themes of optimization, equilibrium, and empiricism to not only illustrate the power of simple economic ideas, but also to explain and predict what’s happening in today’s society. Each chapter begins with an empirical question that is relevant to the life of the reader, and is later answered using data in the Evidence-Based Economics feature. As a result of the text’s practical emphasis, readers will learn to apply economic principles to guide the decisions they make in their own lives. Daron Acemoglu is Elizabeth and James Killian Professor of Economics in the Department of Economics at the Massachusetts Institute of Technology. He received a BA in economics from the University of York, an MSc in mathematical economics and econometrics from the London School of Economics, and a PhD in economics from the London School of Economics. He is an elected fellow of the National Academy of Sciences, the American Academy of Arts and Sciences, the Econometric Society, the European Economic Association, and the Society of Labor Economists. Acemoglu has received numerous awards and fellowships, including the inaugural T. W. Schultz Prize from the University of Chicago in 2004, the inaugural Sherwin Rosen Award for outstanding contribution to labor economics in 2004, the Distinguished Science Award from the Turkish Sciences Association in 2006, and the John von Neumann Award, Rajk College, Budapest, in 2007. He was also the recipient of the John Bates Clark Medal in 2005, awarded every two years to the best economist in the US under the age of 40 by the American Economic Association, and the Erwin Plein Nemmers Prize awarded every two years for work of lasting significance in economics. He holds honorary doctorates from the University of Utrecht and Bosporus University. His research interests include political economy, economic development and growth, human capital theory, growth theory, innovation, search theory, network economics, and learning. His books include Economic Origins of Dictatorship and Democracy (jointly with James A. Robinson), which was awarded the Woodrow Wilson and the William Riker prizes, Introduction to Modern Economic Growth, and Why Nations Fail: The Origins of Power, Prosperity, and Poverty (jointly with James A. Robinson), which has become a New York Times bestseller. David Laibson is the Chair of the Harvard Economics Department and the Robert I. Goldman Professor of Economics at Harvard University. He is also a member of the National Bureau of Economic Research, where he is Research Associate in the Asset Pricing, Economic Fluctuations, and Aging Working Groups. His research focuses on the topics of behavioral economics, intertemopral choice, macroeconomics, and household finance, and he leads Harvard University’s Foundations of Human Behavior Initiative. He serves on several editorial boards, as well as the Pension Research Council (Wharton) and Harvard’s Pension Investment Committee, and the Board of the Russell Sage Foundation. He has previously served on the boards of the Health and Retirement Study (National Institutes of Health) and the Academic Research Council of the Consumer Financial Protection Bureau. He is a recipient of a Marshall Scholarship and a Fellow of the Econometric Society and the American Academy of Arts and Sciences. He is also a recipient of the T. W. Schultz Prize from the University of Chicago and the TIAA-CREF Paul A. Samuelson Award for Outstanding Scholarly Writing on Lifelong Financial Security. Laibson holds degrees from Harvard University (AB in economics), the London School of Economics (MSc in econometrics and mathematical economics), and the Massachusetts Institute of Technology (PhD in economics). He received his PhD in 1994 and has taught at Harvard since then. In recognition of his teaching excellence, he has been awarded Harvard’s Phi Beta Kappa Prize and a Harvard College Professorship. John A. List is the Kenneth C. Griffin Distinguished Service Professor in Economics at the University of Chicago, and Chairman of the Department of Economics. He received his BS in economics from the University of Wisconsin—Stevens Point and his PhD in economics from the University of Wyoming. Before joining the University of Chicago in 2005, he was a professor at the University of Central Florida, University of Arizona, and University of Maryland. He also served in the White House on the Council of Economic Advisers from 2002—2003, and is a Research Associate at the NBER. List was elected a Member of the American Academy of Arts and Sciences in 2011, and a Fellow of the Econometric Society in 2015. He also received the Arrow Prize for Senior Economists in 2008, the Kenneth Galbraith Award in 2010, the Yrjo Jahnsson Lecture Prize in 2012, and the Klein Lecture Prize in 2016. He received an honorary doctorate from Tilburg University in 2014, and was named a Top 50 Innovator in the Non-Profit Times for 2015 and 2016 for his work on charitable giving. His research focuses on questions in microeconomics, with a particular emphasis on using field experiments to address both positive and normative issues. For decades his field experimental research has focused on issues related to the inner workings of markets, the effects of various incentive schemes on market equilibria and allocations, and how behavioral economics can augment the standard economic model. This includes research into why inner city schools fail, why people discriminate, why people give to charity, why firms fail, why women make less money than men in labor markets, and why people generally do what they do.